England produced one of their poorest performances to crash out of the World Cup with an ignominious nine-wicket defeat by South Africa in Barbados. Andrew Hall took a devastating four wickets from nine balls and finished with 5-18 as England were bowled out for a feeble 154 in 48 overs. 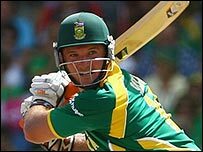 South Africa captain Graeme Smith then smashed 89 not out to usher his team to victory with more than 30 overs left. The Proteas thus took the remaining semi-final place in emphatic fashion. The manner of South Africa's run chase was indicative of a team determined to make a statement. They began the tournament rated the number one side in the world and briefly threatened the status of World Cup holders Australia as favourites. But some poor performances, including a heavy loss to Bangladesh, left a few questions in the air. They will hope to have answered them with this performance. Instead, it is England who go back to the drawing-board - with the make-up of the batting order the principal concern. If they fail to beat West Indies in their final match, Michael Vaughan's team will have ended up losing to five Test nations in the tournament, and beating just one - Bangladesh. At the toss of a match many were expecting to be a close, tense affair, Vaughan called correctly and elected to bat first. But the captain took 20 balls to get off the mark as England's top order did their normal thing of failing to take advantage of the early over fielding restrictions while also losing wickets. The score was just nine in the eighth over when Ian Bell's speculative hook ballooned off a top edge to square leg. With Shaun Pollock bowling almost non-stop maidens at one end, it was Vaughan himself who was the next man to be dismissed, for 17 (more or less his World Cup average). He had actually managed to hit a couple of decent fours when he inexplicably missed a straight ball from Andre Nel which thudded into his pads in front of middle stump. Kevin Pietersen, the only batsman opposition teams fear when playing England, also failed. He had three runs to his name when deciding to try to drive his 15th ball wide of mid-on for four. 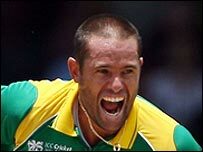 But the delivery from Nel forced the bat to twist in Pietersen's hands, the ball lobbed out towards mid-off, and Smith dived forward to take a good catch. Andrew Strauss (46) and Paul Collingwood (30) had a repair job to do, and initially did it quite well - adding 58 in 16 overs. Oddly, they began to score slower and slower, with Jacques Kallis proving particularly hard to get away. Finally, in the 33rd over and with the score on 111, Strauss picked out Smith off Kallis - the skipper having plonked himself cleverly as a floating close catcher at about fourth slip. That wicket was the catalyst for a remarkable burst of wickets from Hall, who took his first four wickets in nine balls and ultimately finished with his best return ever - and the best by a South African in World Cups. 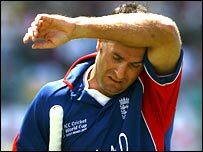 Hall surprised Collingwood with extra pace to remove him lbw, bowled Andrew Flintoff with reverse swing and smoothly accounted for both Paul Nixon and Sajid Mahmood. Ravi Bopara, however, was not fazed and the Essex right-hander cobbled together a stand of 23 with Monty Panesar before the latter nicked Nel (3-35) to Mark Boucher. And when Anderson came in Bopara (27 not out) tried to farm the strike as best he could before Hall returned to remove the last man lbw. England's batsmen had made the pitch look awkward, with suggestions of uneven bounce. But Smith and AB de Villiers attacked England's bowlers with such ease and confidence that it looked like the two teams were playing on different wickets. De Villiers took two boundaries from each of Mahmood's first two overs and when Vaughan switched to Flintoff, Smith thumped the all-rounder down the ground for four more first ball. Panesar was also given the treatment, and although De Villiers did fall to an edge off Flintoff for 42, it remained one-way traffic. Mahmood's laughably awful attempt at stopping a boundary brought up the 100 in the 11th over, and new batsman Kallis also hit some hefty blows. But it was Smith who really humiliated England's bowlers. The only mistake he made was when he was caught off a Mahmood no-ball - it was that sort of day - and he smashed the winning boundary not long afterwards. He had hit 13 boundaries in all, scoring his runs from 58 balls.